I am loving pre-fall 2011, designers have really out done themselves in comparison to the spring 2011 collections. I really love that they are all wearable, but are still different in the silhouettes, or incorporation of prints! 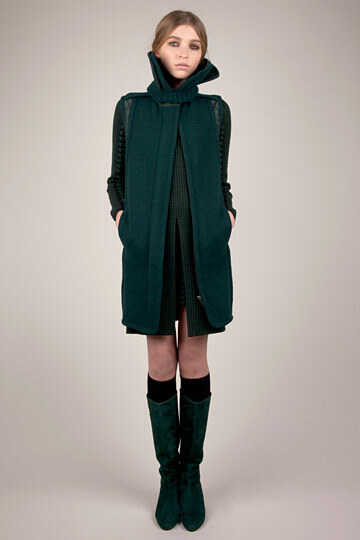 My favorite collection so far has to be from Pringle of Scotland. The designs are just so sophisticated, chic while still being really warm and cozy! I love that. What's your favorite pre-fall collection?? + It's winter break!! YAY!! Now I actually have time for Christmas shopping, Cleaning, Sewing, and Relaxation. And oh yeah blogging of course!! :) I'll be catching up on my favorite blogs!! + Other than that, I hope everyone is enjoying their winter break, and their holidays!! I'm really excited for Christmas, and New Year's!! I love that perfect little leopard print dress! i love the thakoon addition, hadn't seen that one yet.. other than that, i've posted a few favorite collections over at my blog! layering black on black is kickass. awesome blog thanks for stopping by babe. The leopard dress is amazing. I just bought my first animal print and it is leopard and now I love it.